Maryann Simpson has been knitting since she was 12 years old. She has been a trauma nurse for the past 32 years. No stranger to farming before moving to the Dayton area, Maryann lived on a 30 acre farm near Medina, OH where she raised Appaloosa horses, Hereford cattle, chicken and turkeys. Maryann also boarded alpacas for neighboring farms during the importation from Peru. She has since retired from nursing and raises her own alpacas near Dayton. 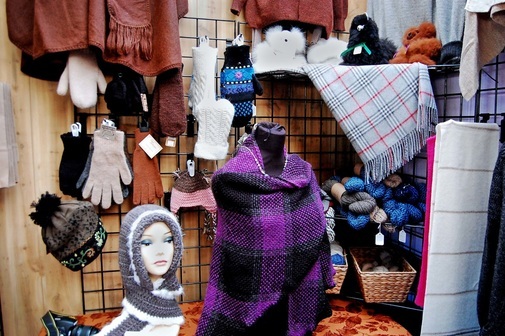 She breeds and sells alpacas as well as processes their fiber for spinning, knitting and weaving finished products for sale in her shop, regional shows and festivals. Maryann has also been spinning & dyeing yarn and is weaving beautiful custom alpaca rugs and scarves on one of her seven looms. "There is absolutely no substitute for the best. Great products cannot be made of inferior raw material. I use the best fiber available and try to waste nothing." All this led to her passion of working with natural fibers. Natural fibers are a sustainable and renewable resource, harvested every year without harming the animals. Although alpaca is her fiber of choice, Maryann has also uses or blends other fibers with the alpaca depending on what type of finished product she is producing. Alpacas produce 23 different natural colors. New World Alpaca Textiles also hand dyes custom fiber and yarns in many vibrant colors to suit our clients. First of all you need looms! We now have eleven looms with capacities ranging up to 60 inch width. Alpaca yarn is a dream to weave. Alpaca rugs are beautiful yet durable. I have used cotton core alpaca yarn, jute and nylon core rug yarn. These rug yarns all have a different feel, but it's all alpaca and it feels great. Nothing creates better "Floor Art" than alpaca yarn. A peek into our creative nest located at the 2nd Street Market in Downtown Dayton. Contact us to do custom rug weaving or other Alpaca woven items.